Kabarkada Interactive specialize in web design and web development, if you're planning to set up a website for your business, you've come to the right place! Kabarkada Interactive will render the best website from concept creation to deployment with realistic and competitive prices affordable to businesses of all sizes. 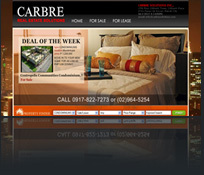 Description: Carbre Solutions offers a wide collection and list of House & Lot, Lot, Commercial, Industrial, Townhouses, Beach Resort, Townshares and even Condominiums.